The killing of a Taliban Chief on Pakistani soil signaled that America is not sincere with the peace process in Afghanistan. Washington’s acts to sabotage efforts of talks clearly highlighted that NATO is interested in a further stay, with the aim of achieving geopolitical objectives in the region. That’s why every time when talks with the Taliban reach the edge of success, the USA unexpectedly takes such steps that spoil the whole peace process. The US’ global hybrid war strategy has already disrupted the multipolarity of the globe, which is currently under construction by China and Russia. Therefore these two multipolar world leaders have become the direct targets of America, who have introduced a manual of unconventional warfare (UW) in 2010 by revising the cold war mentality to save unipolar hegemony over the world. Emerging geographic battlefields from Latin America to Africa and Asia to Europe have witnessed how the US is exploiting the world to achieve geopolitical objectives. The US has not only adopted a destructive approach to contain multipolar regional and global integration through fueling ethnical, regional, political and religious conflicts, but now Washington is also working to constitute a consolidated bloc of unipolar well-wisher states to encircle/isolate Russia and China economically, politically, and military. For this purpose, under the US command of NATO, countries have not only imposed economic sanctions on Russia but their forces have already reached the borders of Russia while on other side, the US has introduced an Asian NATO-like project to counter China through meddling with the South China Sea island geopolitics and fueling the border disputes of China with its other neighboring states. In this emerging scenario where the US is pushing the world to total war, (World War III) the NATO presence in Afghanistan has become more alarming and dangerous for the whole region. This essay aims to cover NATO’s containment policy in Afghanistan against China’s Silk Road and Eurasian regional integration through highlighting the challenges for the regional security blocs Shanghai cooperation organization (SCO) and Collective Security Treaty Organization (CSTO). The killing of Taliban leader Mulla Akhtar Mohammad Mansour in a US drone strike in Baluchistan has also killed the Afghan Peace process that was under way with the Quadrilateral Coordination Group (QCG), which consists on the representatives of Afghanistan, Pakistan, America, and China. The purpose of these QCG four countries was to seek the solutions of Afghanistan’s conflict through engaging with the Taliban in peace talks. But unfortunately, the US was unhappy with the growing influence of China in Afghanistan. As China introduced the Belt Road initiative of the Silk Road for Afghanistan and Pakistan, US opted to sabotage the negotiations between China and Pakistan with the Taliban. The US has not only derailed the Afghan peace process but it has also aggressively opposed peace talks with the Pakistani Taliban as Washington believed a peace accord with the Taliban in Pakistani side would mean an end to Pakistani military operations against them and free them up to shift to neighbouring Afghanistan to fight against the US-led NATO and foreign forces. The same drone strike carried out by the US in South Waziristan that killed Pakistani Taliban commander Nek Mohammad in June 2004, which destroyed the April 2004 peace agreement, was concluded by the Pakistan Army with local militants. Pakistani media reports suggests that the US also torpedoed a few other peace initiatives, including the one between the Pakistani government and the Tehrik-i-Taliban Pakistan (TTP) commander Maulana Faqir Mohammad in Bajaur Agency and with TTP head Hakimullah Mehsud in Waziristan by undertaking drone attacks just in time to derail any prospects of peace through negotiations. Pakistan’s Interior Minister revealed that QCG succeeded in negotiations with Taliban to declare Kabul as a war free zone, but the US drone strike on the Taliban’s chief is a message that the US wants war instead of peace. The main U-turn in US policy to oppose the Afghanistan peace process came after the China’s announcement of the Silk Road. Pakistan and Afghanistan both are Silk Road countries from an ancient time. China’s neighbouring countries - Pakistan, Afghanistan, and Tajikistan - are directly connected with the Silk Road, which is also called the Karakoram highway (KKH) in this region. The China-Pakistan economic corridor (CPEC) is under construction, which will transport $46 billion of value along this KKH, connecting Pakistan’s deep-sea port Gwadar with the Chinese Silk Road hub Xinjiang. The border of both central Asian countries Tajikistan and Afghanistan are also connected with Xinjiang along the CPEC. Beside this, Gwadar port also provides the shortest potential route for all land locked central Asian countries to reach the warm waterways of the Arabian Sea. Moreover Beijing has also engaged Kabul with multibillion development projects that aim to connect CPEC with Central Asia through Pakistan’s transit trade routes which provide shortest land access to Russia-led Eurasian Economic union to reach south Asia and East Asia via India and Myanmar. By analyzing this upcoming regional integration, the term Zipper was introduced for Pakistan. The above emerging scenario of Eurasian Silk Road integration vexed unipolar well wishers to adopt an aggressive containment policy. Therefore US/NATO had refused withdrawal from Afghanistan and aim to use Afghanistan’s hostile situation against this upcoming regional integration. Stability in the region is directly connected with Afghanistan, and NATO’s further stay will lead to more chaos in the region, as Blackwater is facilitating Afghan separatist groups to hold the black flag of Islamic State of Khorasan. For this purpose NATO, with its member state Turkey, is assisting ISIS to produce drugs and smuggle them from Afghanistan to Central Asia and Europe. Afghan’s drug money has become the main source of militant’s funding. There is no doubt that Russia is fighting a SCO war with ISIS in Syria because ISIS is considered to be a potential threat to the homeland of SCO. Afghanistan, Pakistan and the Central Asian states were a target for ISIS. In ISIS’ literature, these territories including China’s Xinjiang can be seen as “KHORASAN”; the branch of Islamic State. History witnessed that the US intervention in Iraq created ISIS in the Middle East, and now the same policy has been adopted by the US in Afghanistan to prevent regional integration through creating/supporting ISIS militants. Therefore, Russia has warned Pakistan and Afghanistan to take strict measures to prevent ISIS’ influence from growing. The Russian presidential envoy to Afghanistan Zamir Kabulov once said in April that there are now 10,000 ISIS fighters in Afghanistan. A year ago there was a hundred. This growth over the period of a year is spectacular. So the dramatic increase of ISIS terrorists in Afghanistan highlights that the US-led NATO is deliberately exporting this new form of militancy in Afghanistan to contain Russia and China in this region, as Washington has already accelerated to present Russia and China as imaginary threats to Europe and Asia. From the South China Sea to the Baltic Sea, we can observe how the US’ hybrid war is working against the Sino-Russian led multipolar world. Recent clashes between the Taliban and ISIS militants showed that the Taliban is only force who can defeat this new form of ISIS militancy that is getting strength under the umbrella of the US-led NATO in Afghanistan. The presence of ISIS is not only unacceptable for the Taliban but it is also against China, Russia, Iran, Pakistan, and other regional countries. As was mentioned above, the US is already using Afghanistan’s hostile situation against Pakistan, China, and the Central Asian states, and now NATO is creating a new enemy in the form of ISIS in Afghanistan, so that it can get the Turkmenistan-Afghanistan-Pakistan-India (TAPI) gas pipeline security contract. That’s why NATO is supporting separatists groups against Taliban. Beside this, the Taliban has already been accepted as a stakeholder by the Afghanistan government and regional countries. That’s why Russia and China support peace talks with the Taliban. As media reports suggested, World powers (Russia and China) seek an unlikely alliance with the Taliban as 'interests coincide' in battle against a shared enemy - ISIS. Some reports also claimed that Mullah Akhtar Mansour travelled to Iran in March to seek Iranian assistance against ISIS, but upon his return to Pakistan a US drone strike was carried out, and as a result he was killed in the Pakistani side of Baluchistan near the Iranian border. The US needs to secure western interests through blocking the development or to be a shareholder of the integration. It is impossible later, in the presence of China and Russia, which is why the USA harassed Afghanistan, Pakistan, and India to join this pipeline despite the alternate Peace pipeline (Iran-Pakistan-India pipeline). Here it is also necessary to mention that this TAPI pipeline was the main reason for the Afghanistan invasion because at that time the Taliban government refused to give the contract of TAPI to the US Company Unocal in conjunction with the Saudi Oil Company Delta. Several analysts believe that 9/11 took place to justify the US invasion of Afghanistan for securing the western strategic interests. As the author pointed out in an article, NATO’s sponsored TAPI gas pipeline has become a trap for the region because NATO wants a new enemy (ISIS) so that it can get the security contract of this trans-countries pipeline. According to available data the US wants to acquire Turkmenistan’s Mary airbase for the security of TAPI. The Mary airbase is a one of biggest airbase of central Asia build by USSR. American presence on this airbase would be unaffordable for energy-rich Caspian Sea countries. The US is not in the mood to leave Afghanistan. TAPI has become the main reason for the further stay of foreign forces. The crisis in the Middle East shows that the US/NATO presence was the main reason of the militancy. Therefore, like the Middle East, peace cannot come in this region without the withdrawal of foreign forces from Afghanistan. CSTO has become a powerful military and political organization of Central Asian states and it is strengthening the political authority of member states and their positions on the international stage, providing stability and security on the international and regional levels. Armenia, Belarus, Kazakhstan, Kyrgyz Republic, Russia, and Tajikistan are the member states while Afghanistan and Serbia have observer status of this military might of Central Asia. According to CSTO documents, “Engagement and cooperation with the CSTO is an issue of importance to Afghanistan as, from the perspective of the CSTO member-states, the stability of Central Asian is directly linked to the stability of Afghanistan”. 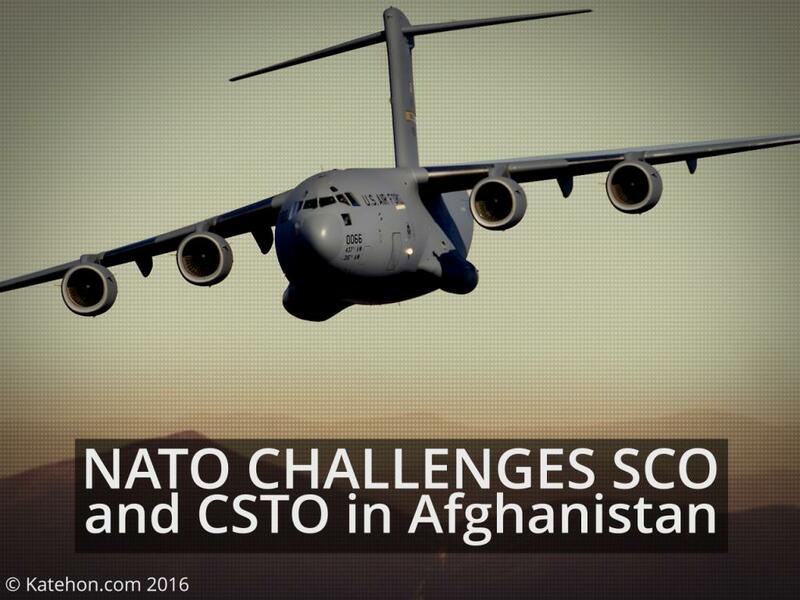 Therefore on the CSTO platform, Russia has offered her shoulder to Afghanistan for stability in the country. While being the founder of CSTO, Russia had proposed multilateral cooperation of CSTO with NATO on the Afghanistan issue but unfortunately NATO rejected CSTO cooperation, as it has adopted aggressive behavior against Russia and its allies in the region. Russian presidential envoy to Afghanistan Zamir Kabulov told to Russian media that the issue of cooperation between NATO and the Collective Security Treaty Organization (CSTO) in Afghanistan is off the table, despite the increasing threat from the Islamic State. After NATO’s refusal, CSTO adopted alternate ways to seek stability in Afghanistan by taking precautionary measures to prevent the penetration of ISIS’ militancy from Afghanistan to CSTO member states. For this purpose Russia is interested to install CSTO military along Afghan borders, especially on Tajikistan’s adjacent border with Afghanistan. NATO’s presence and growing influence of ISIS in Afghanistan posed a great threat to Eurasian Silk Road developmental projects. That’s why all regional countries under the umbrella of SCO are trying to seek a peaceful solution to Afghanistan’s conflict. For this purpose, Regional anti-terrorist structure (RATS) of SCO has been established among the member states Russia, China, Kyrgyzstan, Tajikistan, and Uzbekistan while Pakistan, India, and Iran would be added soon to this regional structure. According to the RAT SCO briefing for counter-terrorism committee of UN Security Council, “SCO Member States currently are facing new threats and challenges, including the involvement of foreign terrorist fighters who are nationals of SCO Member States in conflict zones abroad, in particular in Syria, Afghanistan, and Pakistan; incitement to terrorism and violent extremism through abuse of religious concepts; and financing of terrorism through proceeds from organized crime, including smuggling and trafficking of drugs and weapons. In this regard, RATS SCO has identified priority spheres for its actions to tackle these challenges and has already achieved some tangible results. For example, the Executive Committee of RATS SCO has collected information regarding fighters who participated in armed conflicts in Syria and other areas and listed them in its secure database”. Now that RAT SCO has already established a database of terrorists, it’s time to expand its jurisdiction into Afghanistan so that filtration of terrorists from Afghanistan to Xinjiang, Tajikistan, Pakistan, and other regional countries should be stopped. To secure Eurasian Economic Union (EAEU) integration and China’s Silk Road have become the main priority for SCO. That’s why all SCO countries collectively and individually have maximized their efforts to bring stability to Afghanistan, which is a part of Eurasian security blocs SCO and CSTO as an observer state because stability in Afghanistan is directly linked with stability in Central Asia and South Asia. The US-led NATO’s containment policy regarding regional development has become a great challenge. All efforts that were made by regional countries were spoiled by the US, so this is a time to bypass NATO through introducing new alternatives ways to seek the peaceful solution of Afghanistan so that Afghanistan and the region should be saved from further destruction. The Taliban’s new chief Haibatullah Akhunzada has refused talks and declared war on foreign forces because his former chief was killed by the US at a time when peace talks were underway. The new Taliban Chief was among them who opposed talks so now a new wave of fight against foreign forces would be observed soon. The Taliban will focus on uniting split groups and then they will launch offensive attacks so that they can show that they are still powerful and united. The Taliban have two enemies: one is foreign forces and the other is ISIS, which is supported by NATO. Meanwhile the Taliban’s ideology also shows that they refused to own regional militants groups that are involved in militancy in Chinese Xinjiang, Tajikistan, and Pakistan. So it shows that Taliban is fighting only for Afghanistan against NATO and its proxies. The enemy of an enemy is a friend comes true with the Taliban and Regional countries’ expected alliance. In this region NATO-sponsored ISIS is a common enemy of the Taliban and regional countries of SCO and CSTO. So this is a time for SCO and CSTO to constitute an anti-terrorist mechanism for Afghanistan by seeking new ways to negotiate with the Taliban so that US/NATO’s ambitions to contain regional development will be defeated.